Check out: This all-suite hotel claims to simply be ‘the world’s most luxurious hotel’ in all its branding, and truth be told, it’s not too tall a claim. It is hard to understand the level to which luxury has been taken here, until you enter one of the 202 duplex suites. The smallest suite is the size of an average Dubai apartment, complete with a guest bathroom, spacious living area with a ‘personal business centre’ (with a Macintosh desktop, no less), and an upstairs bedroom with walk-in closet, and a bathroom kitted out with Hermes products (proper full-size bottles at that – not a mini bottle in sight!) and Jacuzzi et al. The décor is opulent, as one is led to expect from the lobby and public areas, with bright primary colours and gold playing a big role, as well as sumptuous fabrics such as silk and velvet – but in the context of how much attention to detail is paid to every little thing here, somehow it all seems to make sense. However, no amount of gild can tot up to much in a hotel, if the service isn’t up to scatch. And here at the Burj Al Arab, where every floor has its own butler, and your every wish is catered to, almost before it’s had a chance to form itself into one in your head, I found the service to be truly flawless – whether it’s to draw up a bath, bring you complimentary evening canapés, or simply to greet you with a smile each time. Start your luxury weekend with a trip to the spa, the lobby for which provides incomparable photo-ops of ‘that’ architectural marvel of a tiered balcony structure. The treatment rooms offer a muted contrast to the bright, aqua colours outside, with a beige colour scheme and some of the most comfy spa beds you’ll find in this town. Each treatment starts with a relaxing foot bath ritual, after which the expert therapists use the finest products to give you a therapy to remember – the signature Wellbeing Massage is highly recommended to lull you into a state of languor that you needn’t bother to get out of, except, perhaps for a dip in the infinity pool, or a soak in your own private Jacuzzi. The only other exertion you might want to put yourself through during your stay is to take a buggy ride to the private beach – that little half-moon slither of Jumeirah coastline, where you can kick back on luxe loungers, with a cooler box of cold towels and chilled water appearing magically by your side as soon as you do. The other option for soaking up some rays is the poolside, which boasts unrivalled views of the turquoise ocean – how often are you this far out onto the water, after all? – and the Palm, as well as a swim-up bar. It’s the perfect way to build up an appetite for a unique dining experience. Feast on: Fresh seafood while you are enveloped by the marine world at the signature Al Mahara restaurant. Designed to simulate an underwater experience, complete with faux submarine-style entrance, the restaurant is centred around an aquarium, with the colourful marine characters providing all the entertainment you’d need for the evening. The menu is a European-style seafood extravaganza, commencing, predictably with a caviar and oyster selection. I opted for the rather more intriguing hand-dived scallops dish – as beautifully presented as it was delicious – a yabbie veloute, and the grilled wild seabass which came highly recommended. There are meat and vegetarian options as well for those who may not fancy eating fish as they watch the beautiful creatures dance around them, as well as an array of gourmet desserts that would make any sweet lover shed a little tear of joy. While this may be a stand-out dining experience, to truly make the most of all that the Burj offers, food-wise, book in for a Culinary Flight – a progressive lunch or dinner that can take you from Al Muntaha for European delicacies to Junsui for Asian, the Skyview bar for drinks with a view or dessert at spectacular lobby restaurant Sahn Eddar restaurant. For me, the best measure of any hotel’s gastronomic excellence lies in its breakfast, and in that, the Burj doesn’t disappoint. The freshest ingredients, prepared to perfection, enjoyed either poolside at Bab al Yam restaurant, or in the comfort of your own suite – breakfast in your bathrobe, it’s the ultimate luxury! Sign a cheque for: Prices for GCC residents start from Dhs4,000. Room rates start from Dhs6,000, including breakfast, transfers and Wild Wadi access. 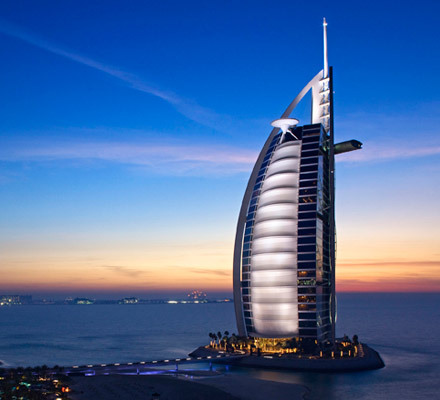 Call +971-4-3017777 or visit www.jumeirah.com. Check out:The stunning infinity pool by the beach, which can be reason enough to make a trip to this iconic hotel ? but there is plenty more to tempt you through its Omani arched doors. An unassumingly simple entrance belies both the grandeur of the lobby – with a showpiece chandelier of coloured Arabic-style lanterns holding court – and the sheer size of the low-lying resort. With stylish design at its heart, like all GHM hotels, the Chedi has been built to pay tribute to the traditional architecture of Oman – think whitewashed walls, and Islamic arches – combined with Zen Asian minimalism. The sprawling landscaped grounds are dotted with pools of water, surrounded by paved pathways, and oversized urns, with flaming torches creating a magically romantic atmosphere after dark. The rooms feature views of either the private beach, the Hajjar mountains, or the landscaped gardens, and come equipped with not only all the mod cons you’d expect from a hotel of this stature, but also thoughtful add-ons such as free iPods for use with the in-room docks, and complimentary mini-bar access (a growing trend in luxury hotels around the world that we thoroughly approve of). If you splash out on a Club Room or Club suite – which come with a separate living room area, outdoor terrace, and spacious bathrooms complete with oversized terrazzo bath and Acqua di Parma amenities – you can also enjoy the additional benefits of limo airport transfers, and access to the Club Lounge which offers private breakfasts, afternoon tea, cocktail hour, and a library. But you will likely not have time for any of these diversions with the three gorgeous pools to tempt you, whether it’s the aforementioned adults-only beachfront Chedi pool with king bed-sized sun loungers; the family-friendly Serai pool; or the more recently opened Long Pool (the Chedi has a penchant for naming things very simply – The Spa is called just that, as is The Restaurant, but more on that later). Located by the spa, the Long Pool is, true to its name, one of the longest pools in the Middle East and is the perfect place to do a few laps before heading upstairs for a treatment. The Spa, located above the state-of-the-art fitness lounge, offers signature Balinese treatments in massive hotel room-sized treatment rooms, with private changing areas and free-standing baths. A serene environment, top-of-the-line products such as the nature-focused Ila range, and the Asian touch come together to create a sublime spa experience. Feast on: The Restaurant is an all-day dining restaurant that offers a buffet-and-à la carte combined breakfast and lunch by day, but turns into a glamorous signature dinner venue by night. Opt for lunch at one of the laid-back poolside restaurants which serve light bites, and enjoy a sophisticated yet relaxed dinner at The Restaurant, where four open kitchens specialising in Arabic, Indian, Asian and European cooking provide atmosphere to match the cuisine. A highlight of a meal here would certainly be the fresh seafood – I’m told chefs often stock up from fishermen who bring their fresh catch right to the hotel beach – with the grilled seafood salad being a must-have, as well as the sense-dazzling dessert selection. The delightful concoctions from French pastry chef Grégory Legros include inventive dishes such as tahini ice cream, and a selection of signature macarons, developed using local ingredients such as pomegranate and frankincense. In cooler weather, the hotel’s restaurant offerings expand to alfresco options such as the Beach Restaurant, as well as more poolside dining and lounge options. Head out of the hotel for: The Muttrah Souq is one of Muscat’s main attractions, and offers a journey back in time through its labyrinthine alleys, where wrinkled shopkeepers sell a variety of wares. Make sure to include some frankincense products and hand-made silver jewellery or artefacts to your Muscat shopping list. Sign a cheque for: From OMR 145 (Dhs1,450) per room per night. Call +968 2452 4401 or email: reservation@chedimuscat.com. Check out: Before you drive through the large golden gates, reminiscent of an actual palace, brace yourself for a luxe, royal experience, from the glistening fountains in front of the main building entrance, to the impressive driveway which leaves even the most jaded traveler starry-eyed. Perched right at the start of the Abu Dhabi corniche, the Emirates Palace Abu Dhabi, adjacent to a 167-berth marina, is set on sprawling grounds, lush gardens, and is well-known for its gold bar vending machine – where else would you find this? The hotel’s majestic grandeur is evident throughout, from the marble floors, to the ornate ceilings covered in 22 carat gold and silver leaves, Swarovski chandeliers in the lobby, and gold-coated pillars. The hotel complex is also home to high-end stores, glass display cases of ancient artefacts, and exhibits and gifts presented to the UAE ruler (including a real-life size Chinese tea-house). It’s easy to lose your way here, as the hotel is divided into two wings – East and West – with the East wing making for a great stay for families, and the West being a more serene space for couples. The royal experience begins the minute you are handed over a gold coin room access key, and presented a rose by the butler, before being escorted to the room. While the entrance and lobby are extravagant enough, the rooms definitely take fine living up a notch. The Diamond room includes a balcony which opens out to views of the pathway leading to the shimmering waters, a bathroom with Arabic perfume-style bath products, and a bath tub where most of the evening can be spent relaxing in a hot bath. The wood-clad walls provide warmth to the room, which is done up in off-white and gold colours. Each room includes connecting doors as well – ideal for large families, or a group of friends enjoying a summer escape – and a butler on the same floor, who makes sure every request is met instantly. Once you manage to jump out of the plush, comfortable beds, head to the La Brisas pool at the East beach club area to cool off on the hammocks perched on the water, or at the large gazebo jacuzzi. Those who prefer the feel of sand under their feet can go for a walk on the beach, or try out some of the beach activities including snorkelling to see mermaids! Yes, you read that right ? the hotel has placed statues of different animals such as giraffes and elephants, as well as mermaids, in the seas off the hotel’s beach, to provide an underwater experience with a difference. Thrilling banana boat rides and wakeboarding are also available for those who wish to cool off from the August temperatures while packing in a bit of fun. Feast on: A stay at this hotel isn’t complete without indulgent Emirati cuisine, which is why dining at Mezlai is a must. Mezlai, which means ‘the old lock of the door’ offers a genuine and authentic experience, with a menu brimming with Emirati dishes to leave you spoilt for choice. Immerse yourself in all things Arabian at this warm and inviting space, where the décor includes Arabic-lantern chandeliers, a spice souk area filled with wooden buckets of aromatic spices, and a majlis area near the entrance where guests can relax before or after a meal, perhaps with a cup of qahwa (Arabic coffee) or sulaimani tea. Since my dining partner and I had spent the day by the pool and beach, we built up quite the appetite and were happy to see generous portions (if you’re not a big eater, you might want to consider sharing). My dining partner and I skipped appetisers and dove straight into main course, the lamb medfun – a slow-cooked lamb with a thick sweet and spicy chickpea sauce, which came highly recommended by the chef. The lamb fell off the bone beautifully and was incredibly succulent, with each morsel being a pleasure to relish. For desserts we tried the Grand dessert platter which was presented in a gorgeous embossed gold plate, and consisted of traditional delicacies such as bethitha (date biscuits), shebab (a cheese roll in syrup), and sago pudding – a rich and decadent pudding which we devoured. Head out of the hotel for: Retail therapy at the Marina mall, which is located ten minutes away from the hotel. Sign a cheque for: Prices start from Dhs1,700. Call +97126909000 or visit www.kempinski.com/abudhabi/emirates-palace. Check out: Sand dunes and ancient designs were the inspiration for this premium five-star hotel’s architecture, nestled in the heart of the trendy West Bay area of Doha, near the Pearl Island (Doha’s man-made island). As part of the Al Gassar Resort, this idyllic hotel is nothing short of remarkable, with a spacious, airy lobby which boasts a vintage Rolls Royce surrounded by low fountains as its focal point – the owner of the hotel has a penchant for vintage Rolls Royce cars! The sand-coloured painted exteriors exude a subtle Arabian charm, which carries through to the interiors too. Most rooms offer uninterrupted views of The Pearl or Doha’s West Bay area, and the Arabian Gulf. Spacious and luxurious, the Grand Deluxe room is highly recommended for a luxe stay, with its Arabian-style fixtures, beige and gold interiors, and a velvet canopy with tassels over the bed. The bathrooms are no less opulent, with marble flooring, a TV by the bathtub, and Remède bath products that smell divine. The hotel’s enchanting building is reflected in the Olympic-size pool, where a day of leisure awaits, with private poolside cabanas which can be booked for an extra charge. Guests looking to rejuvenate can do so with a treatment at the tranquil Remède Spa, while those looking to keep up with their fitness routine can visit the modern Exercise room.Meander along the sandy private beach at sunset, and enjoy the clean, fresh air that touches your skin. Feast on: The St. Regis Doha has a variety of gourmet offerings including Gordon Ramsay’s restaurant Opal; Jazz at Lincoln Centre, a Jazz bar; Al Sultan Ibrahim, a popular Lebanese eatery from Beirut; and Astor Grill, a steakhouse which is a prime dining destination even on weekdays, ideal for an upscale dinner experience. This chic and modern New York steakhouse and grill features parquet flooring, an open kitchen, and typical New York-style red décor. Take a seat at the high-stool chairs in front of the open kitchen and choose the Chef’s Table experience to try a flavoursome waldorf salad, foie gras and date compote with a sweet and crunchy brioche, a warm and hearty baby pumpkin soup with truffle foam, followed by 400g piece of US striploin – cooked to your liking in an oven with coconut charcoal – served with mashed potatoes and asparagus. End with cheesecake topped with raspberry sorbet and macerated berries for dessert, for a quintessentially New York experience, transported into Arabia straight from Manhattan in true St. Regis style. Undeniably great service and impeccably good food is available at Vine as well, the all-day dining restaurant which offers a hearty breakfast. Filled with natural sunlight courtesy of the high-arched floor to ceiling windows, this breakfast spot offers incomparable views of the Arabian Gulf. At the breakfast buffet, try the eggs benedict with lashings of hollandaise sauce, or choose from cold cuts, Arabic cheeses and dishes such as fatayer, hummous and foul muddamas. Head out of the hotel for: A visit to Souq Waqif, built in a traditional market-style where you can find everything from clothing, spices and perfumes, to incense made from agar wood, as well as a selection of restaurants. Sign a cheque for: Room rates start from QAR1,400 per night. Call +974 444-60000 or visit www.stregisdoha.com.